The ASC controllers normally do not send out any EMF or dirty electricity. In rare cases the controller goes berserk and radiates profusely. We report on such a case and the easy solution. Nearly all solar charge controllers pulse the current thousands of times a second. This makes the charging of the batteries more efficient, but it also turns the wiring into large antennas that radiate radio noise. This is a nuisance for radio amateurs (ham operators) and a health hazard to people with electrical sensitivities. The ASC charge controllers do not have this problem. The fastest they switch is about once a second when the battery is nearly full. However, if the connection to the battery is poor (high resistance) the controller gets confused and starts oscillating and generates a lot of radio noise. The solution is simple. 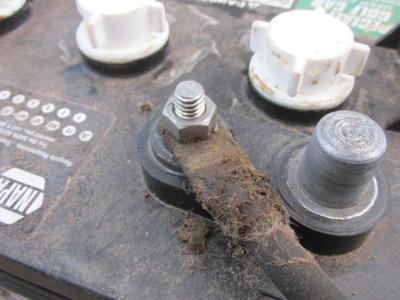 � Any corroded terminals or wires? � Any poorly soldered lugs? � Any overly thin wires? � Try to tighten all screws or nuts. Measure the voltage drops across each cable, while the batteries are being charged. The voltage should be 0.1 volt or less. Be sure to measure on the posts and screw terminals, not on the cable lugs or any exposed copper cable, as that may fool you. 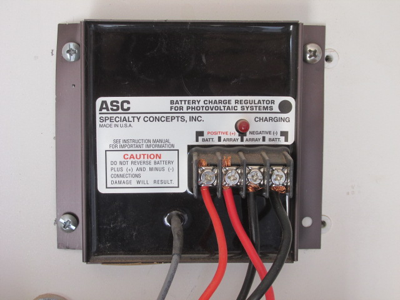 We have three ASC charge controllers in daily use on our remote solar home. They have worked without trouble for years. One of the charge controllers is on a separate system that powers two small pumps in an outbuilding. The system has two 64 watt solar panels and two 6 volt golf cart batteries in parallel for 12 volt. A month or two after replacing the two batteries, I was doing a project in the outbuilding and started to feel typical symptoms of EMF exposures. Using an AM radio it was obvious that there was a lot of radio noise in the room. Moving the radio around it was clear that the noise came from the wires in the wall, the solar panels outside and especially the ASC controller. Normally there is nothing at all. I noticed that the red charging light was dimmer than normal � presumably caused by it turning on and off rapidly. Replacing the charge controller with an identical spare did not help. It was not a case of a faulty controller. It was winter in the desert and the problem showed up only during the middle of the day when the two solar panels put out the most electricity. Disconnecting one panel solved the problem in the middle of the day. The problem was clearly associated with the amount of current going to the charger. Also, the pulsing happened only when the batteries were nearly full, not when they were bulk charged in the morning or when the battery was full. The spec sheet for the ASC controller included a circuit diagram. I gave that to a friend who is an electronics engineer. He said the oscillation could be caused if there was too much resistance in the connection to the battery, such as if the wires were too thin. The voltage drop caused by the resistance would confuse the on/off circuitry and make the charger oscillate, he said. While the charger was actively charging the batteries, we used a multimeter to measure the voltages between the various connection points. The voltage drops should be basically zero across all the cables. We made sure to measure on the posts, not on the cable ends. The two 6 volt batteries were connected in series to create 12 volts. This connection was made by a heavy-duty (6 gauge) copper cable with factory-soldered lugs. But measuring the voltage between the two posts showed a whopping 0.6 difference. That�s a lot for a 12 volt system! The connectors were not corroded and they were not loose. We tried to tighten the nuts and one nut could be given about a one-quarter turn with a wrench. That was all it needed. The system has not fluttered since! Tightening this nut by one-quarter turn stopped the oscillations. The ASC charge controllers are manufactured by Specialty Concepts in the United States and sold by retailers in multiple countries. They are also available on the web. Several articles about zero-EMF solar systems can be found on www.eiwellspring.org/offgrid.html.